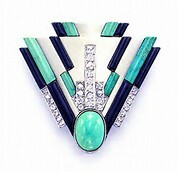 Art Deco, or Arts Decoratifs, took its name from the Exposition Internationale des Arts Decoratifs et Industriels Modernes (International Exhibition of Modern Decorative and Industrial Arts) that was held in Paris in 1925. 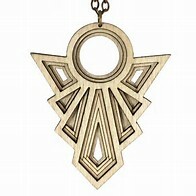 It influenced the design of architecture, furniture, cars, clothing as well as jewellery. It was based on a desire to produce modern styles created with expert craftsmanship and expensive materials such as ebony and ivory. It represented luxury and glamour and encompassed new materials such as stainless steel, plastic and chrome plating. It was popular until the beginning of the Second World war and the introduction of functional and unadorned styles proved necessary. 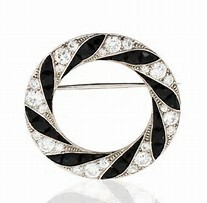 Jewellery of this period is distinctive with its geometric shapes and black and white colours.